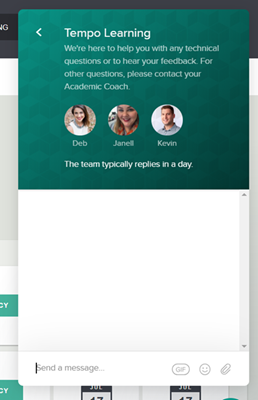 If you are a current Tempo Learning® student, please contact your Academic Coach with any questions you have related policies or billing. The Customer Care Team at Walden is not able to assist with questions about Tempo Learning. For any technical questions, you may reach out to the Tempo Support Team following the steps below. Select the “Intercom” button in the bottom right corner of the screen. Then type your message to the Tempo Support Team. If you are having difficulty logging in to your account, please email TempoOperations@laureate.net.